Check out my favorite Instant Pot BBQ Chicken Stuffed Sweet Potatoes! This recipe is gluten-free and dairy-free and can be made 100% sugar-free. Besides all the health benefits of this recipe, my favorite thing about these Instant Pot BBQ Chicken Stuffed Sweet Potatoes is how amazingly easy they are to make! My family loves anything smothered in BBQ sauce, but did you know 1 tablespoon of store-bought BBQ sauce can contain 6 grams of sugar? Six grams in only 1 tablespoon, how crazy is that? If my family is smothering their food in BBQ sauce, I don’t even want to know how much sugar they are consuming in just one meal! To avoid this, I prefer making my own BBQ sauce. This way, I can control the ingredients and ensure there are zero processed sugars and other processed ingredients. I used maple syrup in my recipe, but you can omit it and use stevia instead to make these Instant Pot BBQ Chicken Stuffed Sweet Potatoes 100% sugar-free. I also prefer to use Primal Kitchen Ketchup when making my BBQ sauce because it helps me to further limit the processed ingredients in this recipe. All the ingredients in Primal Kitchen Organic Ketchup are organic and sugar-free—no sugar alternatives—plus it’s paleo and Whole 30–approved! Leaving out the sugar and processed ingredients definitely doesn’t compromise the taste. My BBQ sauce is still sweet, tangy and absolutely delicious! For this Instant Pot BBQ Chicken Stuffed Sweet Potatoes recipe, roasting your sweet potatoes will provide the best flavor, but if you are short on time, you can cook them in the microwave. You’ll need to cook one sweet potato at a time and poke holes in each one before placing it in the microwave and cooking on high. The cooking time depends on the size of the sweet potato and the strength of your microwave. I suggest checking its doneness after 3 to 4 minutes and then continue to cook as needed. I personally love this recipe for meal prepping. It takes me no time to whip together the BBQ sauce and pour it over chicken in the Instant Pot. I’ll then roast six large sweet potatoes for 45 minutes. Once both are fully cooked, I store them separately in two large glass containers. Each day, I’ll quickly assemble the sweet potato and toppings and reheat it in the microwave or toaster oven for a delicious and satisfying meal! If you don’t have an Instant Pot, a crock-pot works just as well—just cook the chicken on low for 8 hours or on high for 4 hours. In a bowl, combine all sauce ingredients and stir. Place chicken breasts in a crock-pot and pour BBQ sauce over top. Cook overnight on low for 8 hours (or on high for 4 hours). Once chicken is cooked, preheat oven to 400 degrees. Wash and scrub sweet potatoes. Using a fork, poke holes around the entire circumference of each sweet potato. On a baking sheet, roast for 45 minutes. While sweet potatoes are cooking, use two forks to shred chicken in the crock-pot. 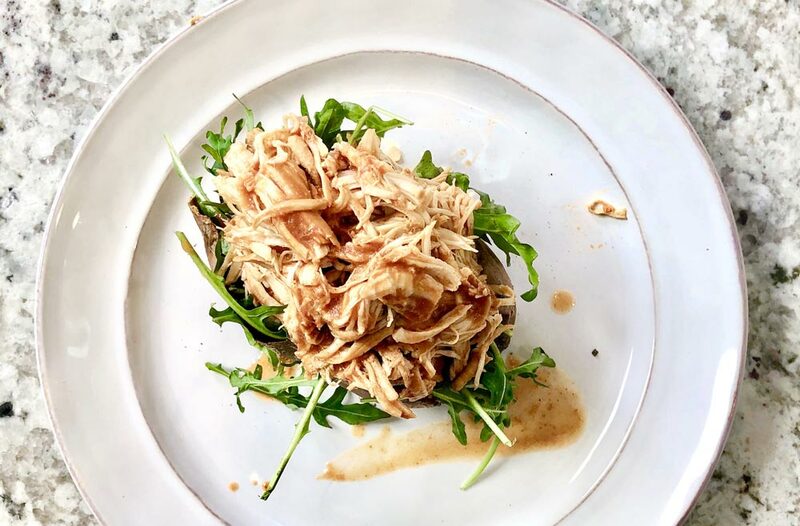 Once potatoes are fully cooked, slice each one lengthwise and stuff with a handful of arugula and approximately ½ cup shredded chicken. Top with avocado slices.